We are down to the wire and everything has been put in place. We are excited to fellowship with you all. Please be very attentive to this post as it will have in detail all reunion information. If you need any assistance from Annie or myself feel free to contact us at the numbers previously provided. Our Family is a circle of strength; Founded on Faith, Joined in Love Kept by God. Together forever! Reunion Fees will be $120.00 for Adults ages 18 and older, and $60,00 per child ages 6-17 years of age. You can send those payments to Dennis or Annie Penn 4215 Twin Oaks Ave. Pascagoula, MS 39581. A receipt will be provided upon arrival. T-shirts prices are as follows: YOUTH S, M, L $10, ADULT S, M, L, XL $10, and anything higher than XL will be an extra charge of $2.00, so, for example, a 2XL shirt will be $12. Please send all of your T-Shirt orders to Annie or me and we will get them ordered. Rooms have been reserved at the Comfort Inn in Moss Point, MS. The address is 6801 MS-63 N, Moss Point, MS 39563. Rates are $80.00 per night. Please call 228.474.3600 to reserve your room under the Thomas-Wright Reunion. Time: 5 p.m.- 10 p.m. Note that on Friday Afternoon and Saturday morning you will be on your own to take in the beauty of the Gulf Coast. We will have more information on attractions in your welcome bags that you will receive on Thursday night. What was the name of the stream flowing under the wooden bridge near the homestead in Lewisville, Arkansas? 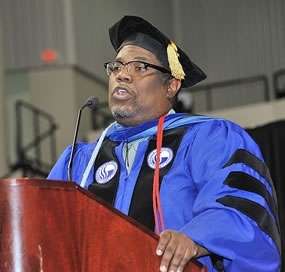 Check out this article on Douglas Thomas, Benjamin S. Quarles Endowed Professor of History at Grambling State University!